Breguet Sympathique, No. 2. 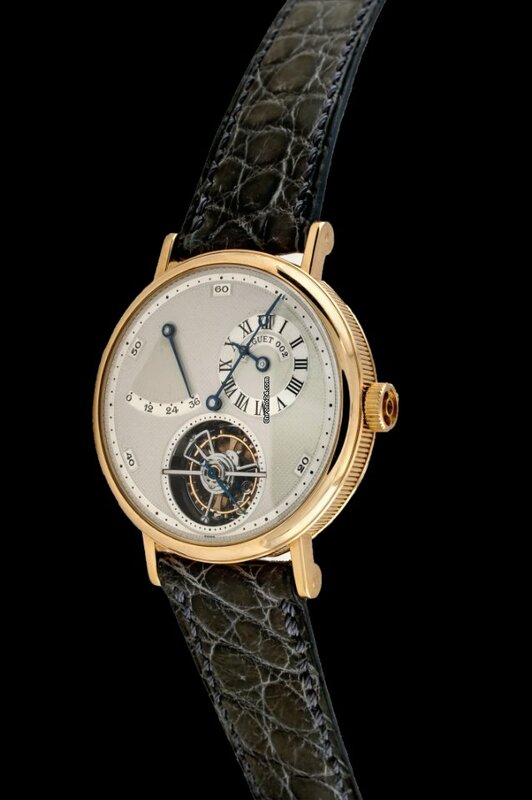 Sold to Tiffany & Co. Breguet, No. 02, made in 1996. Exceptional gilt bronze astronomical 8-day going clock with phases and age of the moon, equation of time, centigrade thermometer, annual calendar with month and date, days of the week, power reserve indication, and 5-seconds remontoire winding spring detent chronometer escapement. Further accompanied by its matching numbered 18K yellow gold Tourbillon wristwatch with regulator-type dial and power reserve. Accompanied by the original morocco fitted box, shipping case, gold magnifying glass, key, a duplicata of the original certificate, and instruction leaflets. The Clock C. Empire style, glazed on four sides and hermetically sealed. Applied hand-chased mounts on all sides, inset against a matte ground, with stylized flowers around the base, the center motifs terminating with palm foliage, the flat-section Corinthian pilasters capped by sunflowers. Recessed panels and the top plate all engine-turned à grains d’orge. Spirally gadrooned bun feet, and turned finials of slightly flattened form with substantial folding handle chased with flowers and lotus leaves and supported by lion heads. Hinged and rising bezel allowing the watch to be inserted with either the gold or leather bracelet still partially attached. D. Silver, Roman hour numerals on a plain reserve, outer minute dot divisions, engine-turned center. Blued-steel Breguet hands. Set in engine-turned dial plate, with sector-shaped apertures for month and date to the left, days of the week to the right, sectors above for equation of time to the left and bimetallic thermometer to the right. Moon phases visible at the back of the wristwatch compartment, with blue enamel and gold disk, the age engraved on the border. 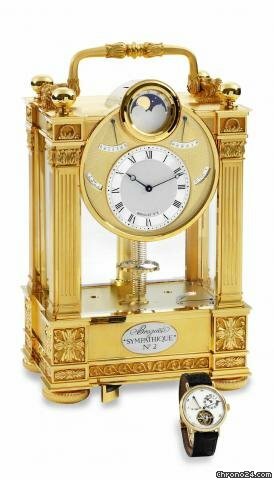 M. Frosted and gilt brass, twin barrels mounted in the base and wound by a retractable lever below the bottom plate, providing power for the clock and winding and setting the wristwatch. 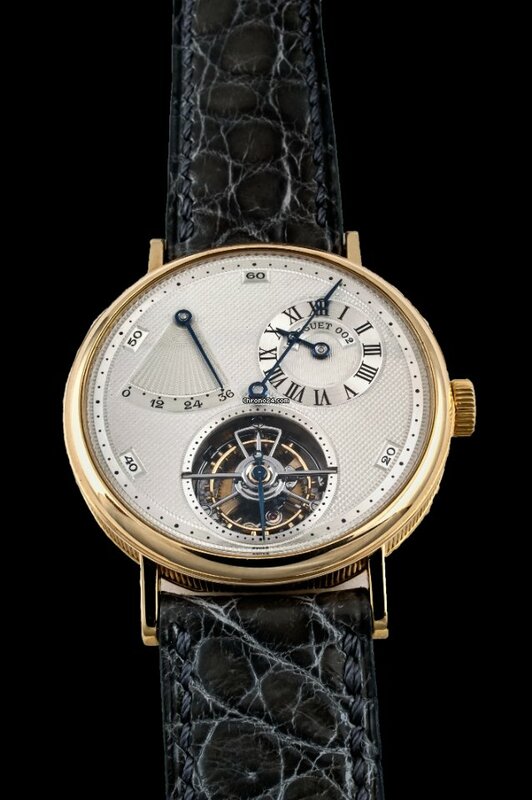 Remontoire train and the escapement mounted on a horizontal triangular platform rewinding at intervals of 5 seconds, spring detent escapement with gold escape wheel, Guillaume balance in brass and invar, with gold and platinum adjusting screws. Twin helical gold balance springs, working in opposition, mounted above and below the balance. Engraved silvered sector for up-and-down scale on the movement top plate. Signed on dial, case, and movement. Dim. 255 x 170 x 125 mm.